I just love it when a piece of furniture that looks utterly hopeless is transformed with a bit of paint. I have had people ask me how I decide what color to paint a particular piece. Truthfully, it just comes to me. Often there is no real plan. The piece just kind of evolves on its own until the finished product. And of course I was certain I had a before photo of this cabinet! But I guess it was shy and this was all I could find. See it really is super ugly! It doesn’t even want to be photographed. It’s totally hiding behind the bed! This behemoth of a cabinet has been sitting in my garage since last memorial day weekend. Most of my pieces “speak” to me at some point and I get some inspiration as to what the finished product will look like. This cabinet must have been the strong silent type. Not even a whisper of what it would like to look like after a little paint. So it sat in my garage, mostly used as a makeshift workbench. I have sat a lot of other pieces on top of it and painted away. But in my recent efforts to tidy up my garage I knew it was time for this piece to be transformed. I had a little left over CeCe Caldwell’s Seattle Mist paint from another project. Seattle Mist is a lovely shade of gray, probably way more lovely than the real Seattle Mist. I prefer the sunshine of California! CeCe Caldwell’s is a chalk paint and I love that you really don’t have to do much (actually nothing but a quick cleaning) to prep your piece. If I had to prime or sand or do anything to this monster in order to start painting it, it would still be sitting in my garage. It’s also totally green which I think is super important these days. I can paint with it anytime without worry about fumes and cleanup is really easy. So I slapped some gray paint on this beauty and I heard a little whisper from it. I could tell this neglected cabinet was feeling a little proud of itself in its new coat of paint. The whisper said dry brush with some CeCe Caldwell’s Antique White over the gray. Suddenly, it was shouting for some graphics. A bit of old Paris would make this cabinet pretty again. So I headed on over to The Graphics Fairy and printed out some awesome French graphics on Lesley Riley’s Transfer Artist Paper. I wanted the top graphic to be big enough to cover the top of the cabinet. Too big for my printer to print. So I headed on over to Block Posters. It is an awesome free website that can turn image you upload into a poster sized image you can print. The Graphics Fairy has a number of tutorials you can use to transfer a graphic on furniture. I opted for following the directions on the TAP. I was a little concerned that I would melt the paint with the high heat of the iron but it worked out just fine. Once the graphics were on, this piece needed to show a little age. So I distressed it with a wet rag (yes you can do that with chalk paint!) and aged it with CeCe Caldwell’s dark wax. That wax really sticks into the texture of the paint and gives it that old world feeling. Love that! Once the wax dried I buffed it to a fine shine with a soft cloth. This cabinet turned out better than I could have imagined and I am so glad it finally spoke up and said something! Oh I love it! I’ve used TAP on furniture also. A color graphic. Beautiful job. 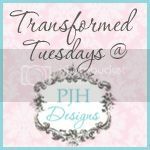 Thank you for joining us at Transformed Tuesday this week.